Croatia was Husband’s pick. It was never top of my travel wish list, I struggled to locate it on a map, but when he mooted this suggestion I was intrigued. The more I read, the more I wanted to visit and believe me, it did not disappoint. We decided on Istria, picked Rovinj as our base and as soon as we got there, were in total agreement this was the most perfect spot. It was a few years ago when we visited – Son was nearly three, so he didn’t much care about where we spent our summer break. His only requirement was a beach. Croatia more than fulfilled this brief. There was not much golden sand, but with 1,000 miles of coast plus 1,185 islands there was no shortage of watery fun. 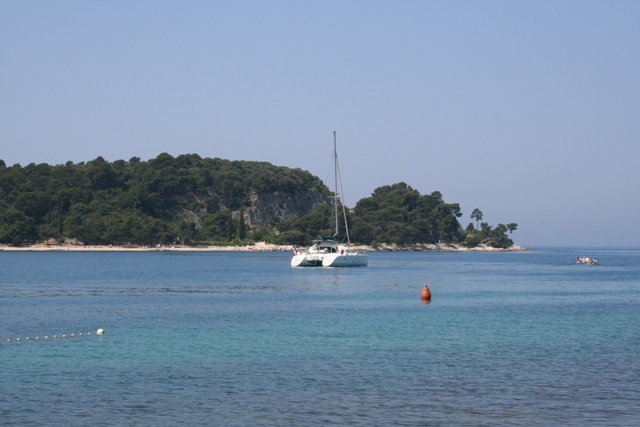 Undoubtedly Croatia has one of Europe’s most spectacular coastlines. The mountains tumble into the clear, island splattered sea and it is the perfect choice for a sunny family holiday. The Istrian Peninsula was wonderful for us as first time visitors to the country. It was full of historic towns (mainly on top of hills), traffic free roads, a dramatic and rocky coastline not to mention a laid back Mediterranean lifestyle and the best food ever. Istria is quite close to the Italian border and only became part of Croatia (then Yugoslavia) at the end of World War 2. We felt it still retained very much its Italian influenced culture and sometimes it felt as if you were in Tuscany. Our base was Rovinj, a stunningly beautiful old town, perched on a hill overlooking the sea. It could masquerade as Venice’s little sister with its narrow streets and steep stone alleyways leading to the water. There were lovely bars and restaurants, a lively quayside, plenty of history and boat trips galore. 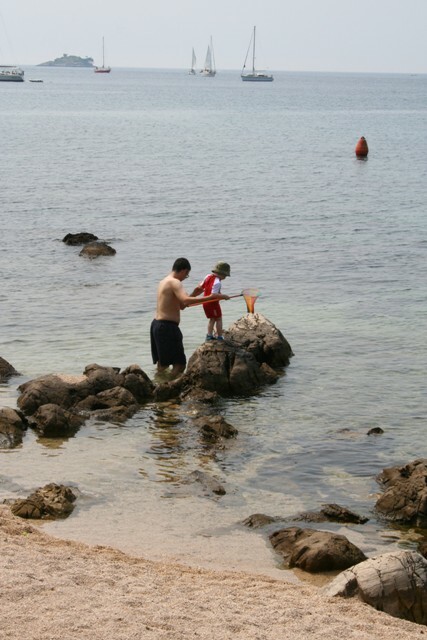 Son was in his element, around every corner was access to the sea and plenty of fishing opportunities. Zlatni Forest Park, just at the edge of Rovinj was a wonderful place full of cycle trails and rocky inlets. 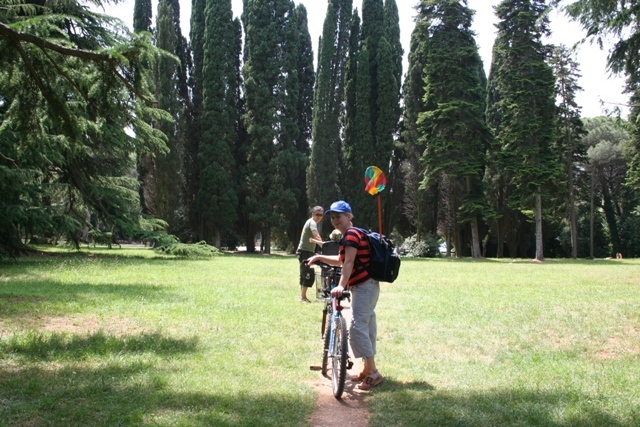 Several times we rented bikes and set off exploring spending the whole day lost in the forest. 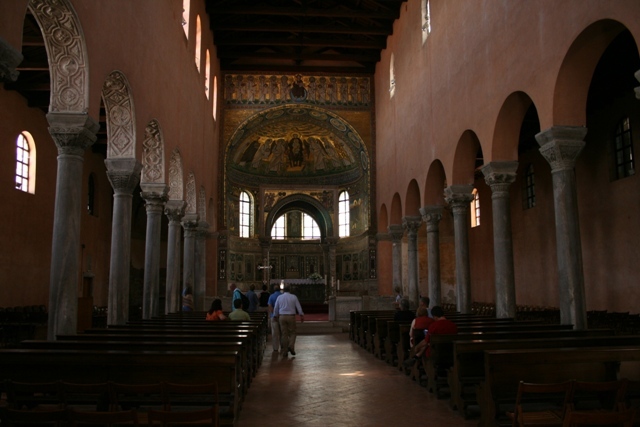 We ventured out of Rovinj a few times and were truly wowed by the Basilica of Euphrasius in Porec – the wonderfully preserved gold mosiacs and quiet reserved atmosphere make it truly deserving of its UNESCO World Heritage status. 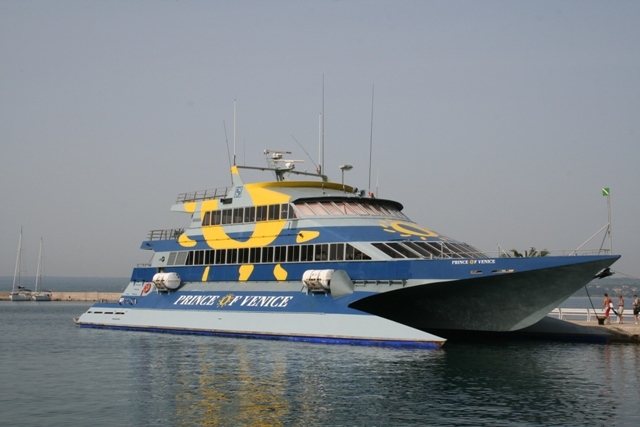 The Brijuni Islands, once Tito’s summer retreat and now reached by catamaran (the journey is almost as much fun as the visit to the islands) was another highlight. The museum there was fascinating, we could have browsed for hours. We even found a rival to the Rome’s mighty Colosseum. 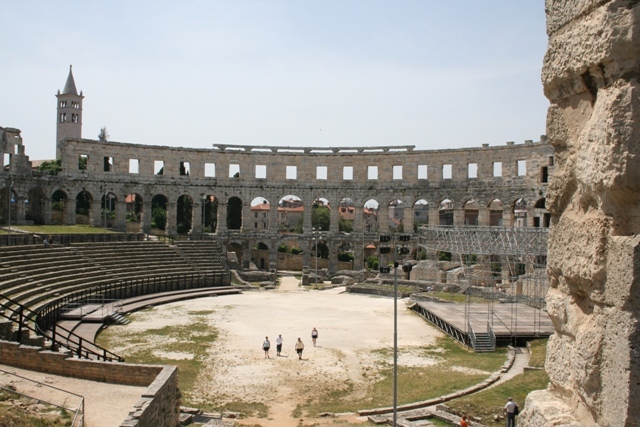 In fact the magnificent Roman amphitheatre in Pula is maybe even a little bit better than its bigger and more well known cousin, we loved it there. Pula also had a stunning old town and there was a real sense of history everywhere you turned. It is hard to pick highlights from our 2 week stay in Istria, everything fitted this list. It is a spectacular place – a lush landscape, an azure coastline, the clearest water I have ever seen and the Italian lilt to the scenery, language and cuisine make it one of the most beautiful places I have been lucky enough to visit. Croatia is on my list—high on my list. Thanks for adding to the temptation. It is gorgeous and makes for an amazing trip! Highly recommend it. We had to decide between Greece and Croatia last year and chose Greece, but reading this, I think we will definitely have to make our way to Croatia this year. Z will be 3 by then, the same age as your son, so your suggestions are great! Thanks! It is a beautiful place for a fantastic family holiday. This is such a beautiful place! Croatia will never top my list of destinations before this! Now, I may consider it to be a good vacation trip, but has to be when my baby is a little older. I would prefer them to enjoy the view and laid back vacation when they are older. Yes, if your baby can appreciate the fantastic scenery a little more, it makes it more fun for you too – it is really beautiful there. Lovely. I’ve always wanted to got o Croatia, I think I need to bump it up the list. It was never top of my list either – but so glad I went there and hope to go back again sometime. Hey Joy, really liked your post on Croatia. I’ve never thought of the country as a ‘high on my list’ destination but you post made me rethink that ranking. After reading about your holiday there, I think Croatia might have to move up a few places – certainly into my top ten. Thanks for an entertaining and informative post. Thank you for reading! It is a beautiful country, was never in my top ten either but we had such a great time there I hope to go back sometime. It’s definitely worth keeping in mind – a great place to bring your family and lots for children to do outdoors. We only skipped through Croatia on a longer trip – you’ve shown us much more than we saw! It looks perfect for a three-year-old (and his parents). It is amazing, we loved it! Would like to go back and explore a different area next time. You did a great job showing and describing Croatia. I really got a feel for it. Thank you! It is so lovely though that words can’t do it justice. Croatia has been high on my list for a few years but I haven’t been able to make a trip there work out yet. One of these days… Thanks for giving me a destination other than Dubrovnik. Great photos – not a typical travel to do site for sure, but sounds great! Merci, too, for visiting my blog. Istria is definitely worth a trip back to Croatia – we loved it. Never been to Dubrovnik though but we would like to go there someday. I am sold! I have always wanted to visit and your review just put this destination up to the top of my list. Thanks for sharing! Thanks for liking my blog. I’ve been thinking about visiting Croatia and am enjoying your posts and pictures. Thank you for visiting mine!! Croatia is wonderful – I definitely recommend it. Thanks for sharing, will be great to be able to travel there with my 3 munchkins! Thanks for liking my post. Have a great day! Thank you for dropping by my blog too! croatia is actually in my top ten list. can’t wait to go there! It is a lovely country, definitely worth a trip! Thank you for the follow! And, happy to see Croatia on your site. I have ‘almost’ gone twice (so close in The Veneto region) so one of these days I’ll make it. Great post. Thank you for reading! Definitely recommend Croatia too. It’s such a lovely country, we definitely want to go back and see more of it too! We would love to go back to Croatia and the lakes are top of our list – seen so many gorgeous pictures and read great things about this national park. Some day…. Loved it, it is such a beautiful and special place. Great post.. we are going to Croatia this summer. Any suggestion where we can see lavenders? You’re so lucky – Croatia is wonderful. Not sure about lavender though…. we didn’t do this, look forward to hearing about it though, sounds interesting!